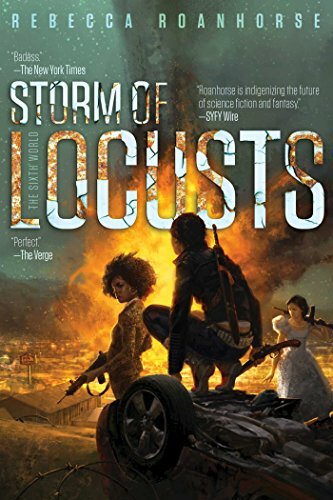 The award-winning author from Santa Fe talks about her newest science-fiction novel Storm of Locusts. Rebecca Roanhorse, award-winning author from Santa Fe, talks about her newest science-fiction novel, "Storm of Locusts.". ASFS Program - A Visit from Santa Fe author Rebecca Roanhorse, who will talk about her latest science-fiction novel, "Storm of Locusts," her writing career and how she started, and upcoming projects. Roanhorse is a Nebula and Hugo Award-winning speculative fiction writer and the recipient of the 2018 Campbell Award for Best New Writer. Her short fiction has also been a finalist for the Sturgeon, Locus and World Fantasy awards. Her novel "Trail of Lightning" was selected as an Amazon, B&N, Library Journal, and NRP Best Books of 2018, among others, and is a 2019 Nebula Finalist. Her short fiction can be found in Apex Magazine, New Suns, and various other anthologies. Her non-fiction can be found in Uncanny Magazine, Strange Horizons, and How I Resist: Activism and Hope for a New Generation (Macmillan). Remember, no outside food is allowed at St. Andrew. Please be discreet with any candy. Water/soda bottles and lidded beverage cups are permitted (until we have a clean-up issue), and there is a water fountain in our meeting space. St. Andrew Presbyterian Church is on the first street north of Erna Ferguson Library on San Mateo. Ponderosa is the northern border of Montgomery Park, and intersects with both San Mateo and San Pedro. The street is north of Comanche and south of Montgomery.